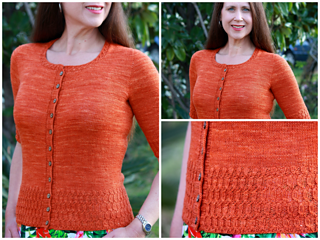 Criollo is a seamless cardigan knit from the top down with fancy ribbing. 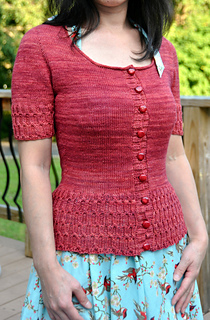 The design uses contiguous method of shaping set-in sleeves developed by Suzie M.
The pattern provides instructions for three lengths of cardigan and three lengths of sleeves. The cardigan should be worn with a little amount of negative ease. There is about 2-5 cm / 1-2” of negative ease already incorporated in the pattern. Note: yardage requirements are in the last pic. 3.0 mm / US #2 circular needle (60 cm / 24” long). 3.25 mm / US #3 circular needle (60 cm / 24” long) and #3 dpns. 3.5 mm / US #4 circular needle (60 cm / 24” long) and #4 dpns. 10 buttons (about 1 cm / 0.5” in diameter), interlocking stitch markers, tapestry needle for weaving, stitch holders / scrap yarn. 26 sts and 36 rows in 10 cm / 4” in St st worked flat with larger needles after wet blocking. Take time to save time, check your gauge. If necessary, adjust needle size to obtain the correct gauge. 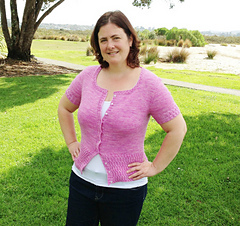 It is crucial for this pattern to obtain the correct stitch as well as row gauge as any differences may result in the cardigan not fitting as intended. This pattern has been tested and tech-edited.